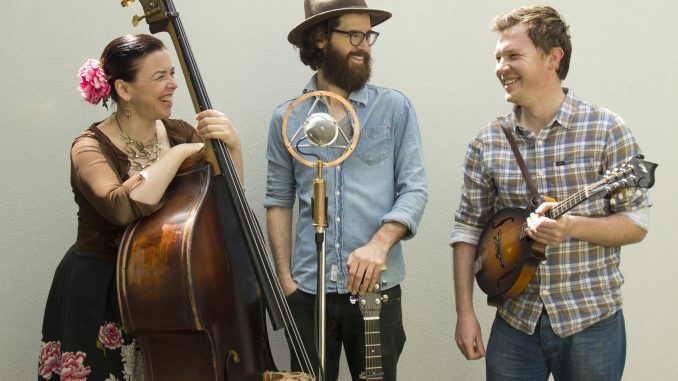 The John Flanagan Trio – made up of award winning songwriter, John Flanagan, charismatic double bass player Liz Frencham and virtuoso guitar and mandolin picker Daniel Watkins – have released their latest album Honest Man. The engaging, moving and at times humorous lyrics on Honest Man zoom from local to universal themes: a cottage in Launceston, a trip to Uluru, driving Paul Kelly in St Kilda, a conscientious objector in Pascoe Vale 1968, awkward new love, lingering lost love, our changing environment, kindling young minds. While the lyrics are speckled with Australiana, the musical arrangements bring a contemporary edge to Americana traditions with bluegrass, country, blues and jazzy influences all adding colour to the band’s folky palette. Honest Man was recorded in Feb 2017 over 4 days at Dog & Bear studio in the beautiful town of Trentham in regional Victoria. They worked with engineer Steve Vella while co-producer/mixing engineer Erick Jaskowiak (The Waifs, Colin Hay, The Mae Trio, Alison Krauss) oversaw the project from Seattle. The trio were joined in the studio by special guest musicians Justin Olsson on drums (LANKS, Oh Pep!, The Little Stevies), Pete Fidler on dobro/lap steel, and Kat Mear on fiddle. The Trio have a big year ahead with spots at Yackandandah and the National Folk Festival followed by their Honest Man album tour. The expansive tour will incorporate cities and regional shows across VIC, NSW, ACT, QLD and SA. About the trio: Award winning songwriter, John Flanagan has been compared to James Taylor and Paul Kelly for his warm vocal delivery and engaging storytelling; Liz Frencham has a remarkable stage presence and a creativity in her double bass playing which has seen her play alongside various artists of international renown. Dan Watkins is recognised as one of the finest young bluegrass pickers in the country on guitar and mandolin and has toured extensively around Australia and the US. Together they combine 60s & 70s folk singer-songwriter influences with a contemporary Americana/bluegrass sound. With tight arrangements and soaring 3-part harmonies they deliver a dynamic and energetic live show that can vary from humorous and uplifting to moving and thoughtful.